The latest entry in Book Passage’s award-winning Cooks with Books program was lunch with Chef Marcus Samuelsson today, to celebrate the release of his remarkable memoir, Yes, Chef. As our Karen West mentioned in her introduction of the Chef today, the literary world lost a talented writer when this man chose to become a chef instead. 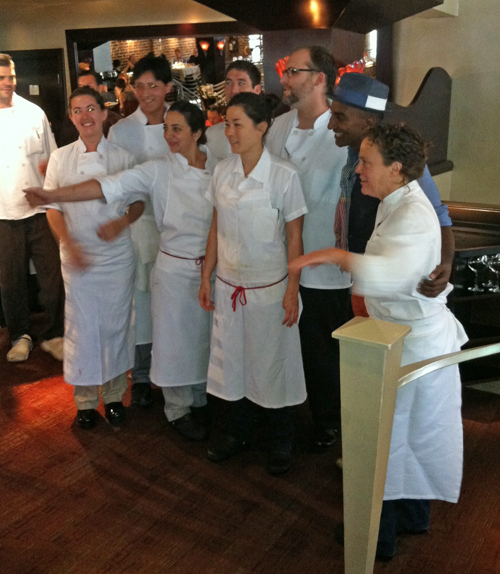 The Cooks with Books lunch was held at Jardinière restaurant in San Francisco, home to celebrated chef and proprietor Traci des Jardins, and she and Marcus apparently cut their teeth together in restaurant kitchens 15 or more years ago, he told us at one point while at the microphone today. 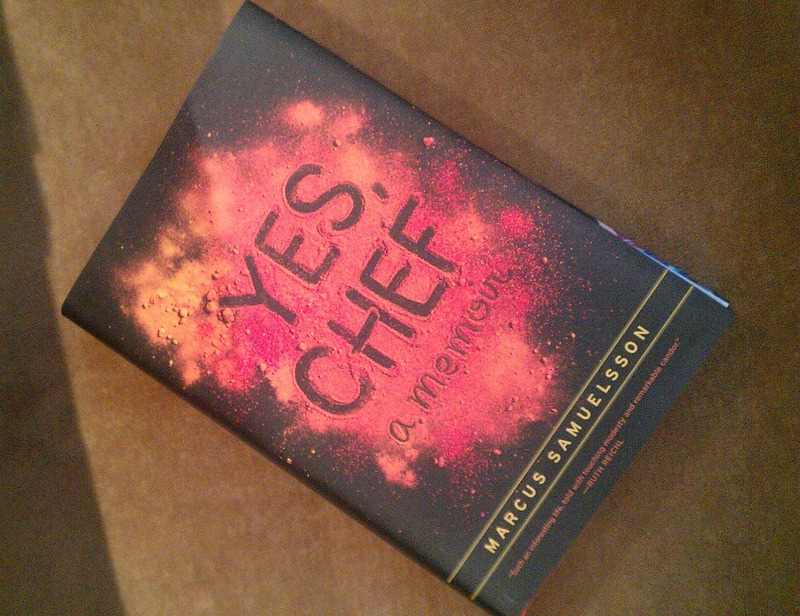 “Chefs are storytellers,” Samuelsson told us. “We have a narrative, a place, emotions to share, and we do it with food.” Born in Ethiopia, reared in Sweden, and now a citizen of Harlem, New York, Samuelsson’s life is one of many stories, and part of what has made him so famous, is the way he shares them. 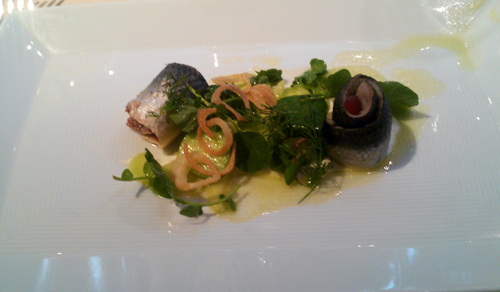 Chef Samuelsson was delighted that Chef des Jardins chose to give us a lunch composed of all Scandinavian foods. When he sat across from me, I was delighted to ask him about it; I know nothing about Scandinavian food. As I told my friend in the car on the way home, all I can recall is that American housewives in the ‘70s when I was a kid, often served “Swedish meatballs” in a sweet gravy, in chafing dishes at dinner parties. We started in Sweden with the first course, Chef Samuelsson told us. “Rollmops” or as I’d like to call them, “Swedish poppers,” were made of cured local sardines rolled around bits of cucumber, with a tiny bit of fresh dill. The plate had watercress and a savory cream. I could eat these little babies all.day.long. They tasted beautifully of the sea, bright and fresh and salty, and of the vinegary cure, and then you got the satisfying crunch of that fresh cucumber in the center. Just delicious. The wine, a Spanish Basque white, “Uriondo Bizkaiko Txakolina” and thank God I do NOT have to pronounce that, was pale gold with a really delicate nose. It was tart, thin apples on the mid-palate, and its bright acid was perfect without being too sharp with this food course. Our next course represented Denmark, said Chef Samuelsson. 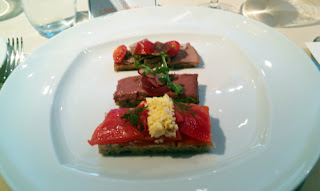 “A Tasting of Smørrebrød” was the menu title for it. Slices of rye bread, very thin, were topped in three different ways —the first with smoked salmon, hard-cooked egg and beets; the second with duck liver paté, radishes, and spring onions; the third with veal tongue and heirloom cherry tomatoes. The salmon was easy to love, of course. The paté was insanely fatty and rich, cut only by the sharp radish and a sip of the wine for this course, Handley Pinot Gris from California’s Anderson Valley, one of my favorite white wine producers. With the rich paté, this silky wine sort of slid right along, and then finished rather bright and crisp. Now, the veal tongue—see, I thought I hated tongue, and then a chef of Traci’s quality comes along and proves me wrong. Part of what made this little sandwich so special, was the sweetness of the cherry tomatoes combined with an extremely acidic dressing. That just worked. Our dessert is native to Norway, Æbleskivers, pancakes formed into little balls around strawberry jam, and dusted with powdered sugar. Light and lovely dessert, deceptively simple. 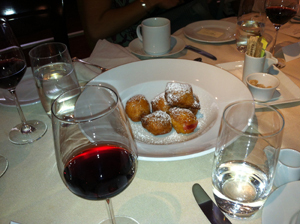 The dessert wine was one of the best I’ve ever tasted, a red Moscato from Trentino, Italy, from a producer named Zeni. I swear I was drinking cocoa mixed with dark cherries. During the meal, Chef Samuelsson circulated through the room, talking with Cooks with Books participants, having his picture taken, discussing the food. Book Passage’s Karen West collected written questions from us and after the meal, Chef Samuelsson took the microphone again and addressed some of them. Where can Americans find good Swedish food, besides at Chef Samuelsson’s Red Rooster in Harlem? He featured some at Aquavit when he worked there, he said, and diners can sometimes find Scandinavian dishes mixed into menu offerings at good restaurants all over the country. His Red Rooster customers are particularly fond of HIS Swedish meatballs. Name an indispensible kitchen tool. Chef Samuelsson said there was a particular spatula that was just the right shape and size and length for multiple uses, and that is what he’d carry in his pocket in the kitchen. Describe what it’s like to be a judge on Chopped, and a contestant on Top Chef. 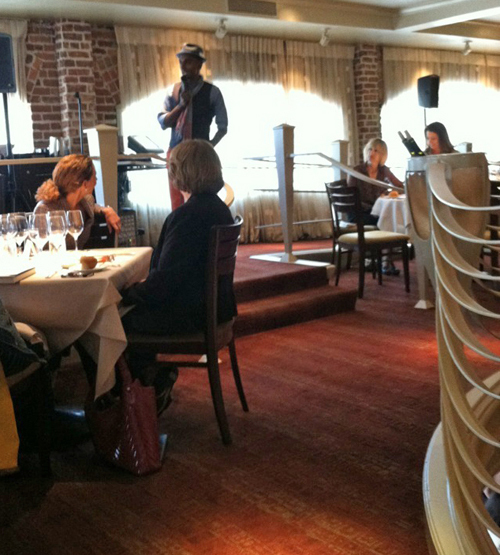 Chef Samuelsson claimed, “It’s always good if you’ve been on both sides of a table. I loved judging on Chopped.” And he gave us a tip about that show—watch for the chef who, by the entrée round of competition, has focused their concentration. They aren’t watching the clock, they aren’t watching the judges, they aren’t watching the others, there is no hesitation as they execute their vision. THAT is the chef who will win that day. If you weren’t with us for this amazing experience, we missed you! Come to our next one. For more information on upcoming Cooks with Books events, click here. Here is Chef Samuelsson with Chef des Jardins (right), and the kitchen staff who prepared our meal.